It was the afternoon of Halloween; a watery sunlight forcing its way through grey clouds. Ahead of me lay miles of treeless moorland: waterlogged peat and rusty grassland disappearing into the mist. Just a mile away stood the notorious Dartmoor Prison, a vast hulk of a building looming on the horizon – its rows of small cell windows glinting in the afternoon sun. I noticed that a little way from it stood a small white cottage, each set of its neat floral curtains firmly closed. According to the owners at least, nobody was home. Perhaps I’ve read too much, but I’ve always thought of moorlands as ill-omened places: hosts to murders and robberies, and that eerie habitual fog. The moors of Dartmoor were where Sherlock Holmes discovered the footprints of a giant ghostly hound and – perhaps more chillingly – where Kate Bush once unleashed her take on interpretative dance; her red dress billowing as she cried for Heathcliff. As her music video ends, she abruptly disappears – another victim perhaps of the perils of the moors, or just the editing techniques of 1980s videography. I’m not sure which. Continuing my walk through Dartmoor National Park, “Heathcliff, it’s me, Kathy” now ringing in my ears, I glanced at my map to check we were headed in the right direction. That I’d timed this trip to fall on Halloween seemed both a fantastic and terrible idea. When describing the location that we were headed, the 18th century Reverend Swete had declared: “it is hardly possible to conceive any thing of the sort so grotesque”, whilst others have named it the most haunted place on Dartmoor. Ask a local to visit this spot after dark, and they’ll politely decline. Apparently, ghosts, spirits and the devil himself hides here. Following the winding path past huge granite boulders, we finally spotted our notorious location: the fabled Wistmans Wood. A prehistoric piece of woodland now stranded alone on the slopes of the West Dart River, its appearance has spawned chilling myths and cautionary tales. This was once the spot where ancient Druids worshipped, enacting all sorts of mysterious pagan rituals. Most recently, it was also where BBC’s Matt Baker had a stumble around, whilst presenting Country File. What a contrast. 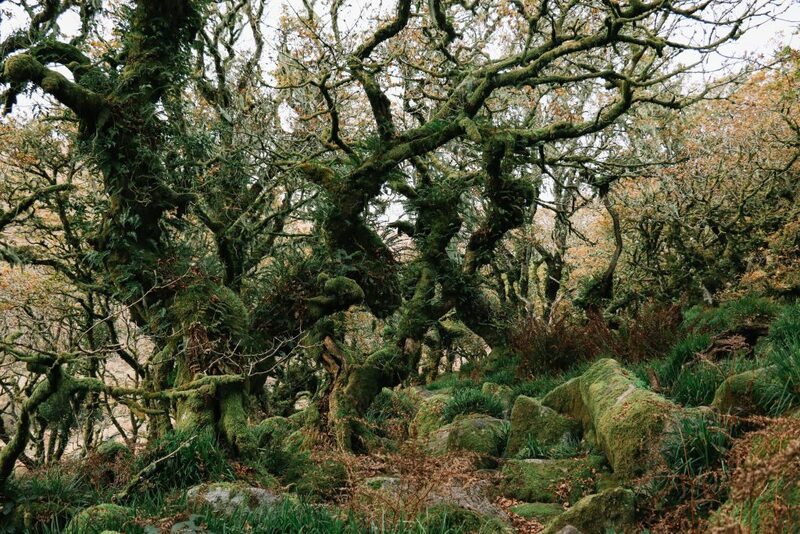 Filled with ancient oak trees, the forest stands at just 5.5 metres tall: the trunks so gnarled, twisted and covered in green lichen, that they barely make shoulder height. From them hang tangled masses of bearded liche; soft green chains that hang like witches’ hair. The sun dipping behind the moorland – Halloween eve now drawing in – we approached this gaggle of knotted oaks cautiously, unsure how to reach them. Eventually we clambered into the middle of this miniature forest, thick green moss covering almost every trunk and branch. It’s a bizarre, beautiful and surreal landscape, although not as grotesque as the evidently melodramatic Reverend Swete had made out. It’s a place that Hansel and Gretel might instead frequent: a beautifully deformed backdrop primed for a fairytale or two. 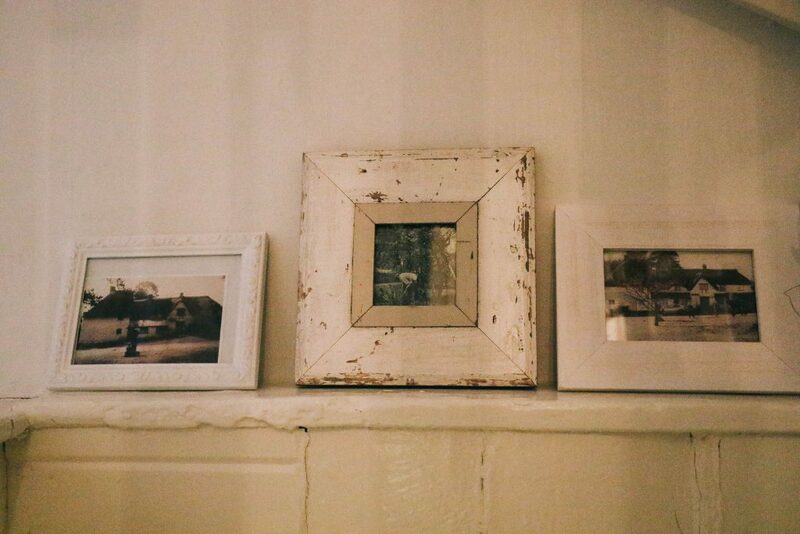 It’s unnervingly beautiful – a photographer’s dream – and a fitting place to welcome Halloween. Dartmoor’s infamous mist now rising, we made our way back to the car, parked just a ¼ of a mile away at the Two Bridges Hotel. We were staying in Dartmoor for the week; promises of wild ponies, blushing sunsets and log fires proving difficult to resist. Our home was picturesque North Bovey: a tiny 13th century village bordered by a rushing river and the climbing slopes of the National Park. Driving in, winding country lanes leading the way, we spotted our home for the week – the magnificent The Riddle, a Unique Home Stays property. A traditional Dartmoor longhouse with parts dating back to the medieval ages, the cottage is one of the most photographed homes in the park; its portrait appearing on postcards littered throughout gift and antique stores. 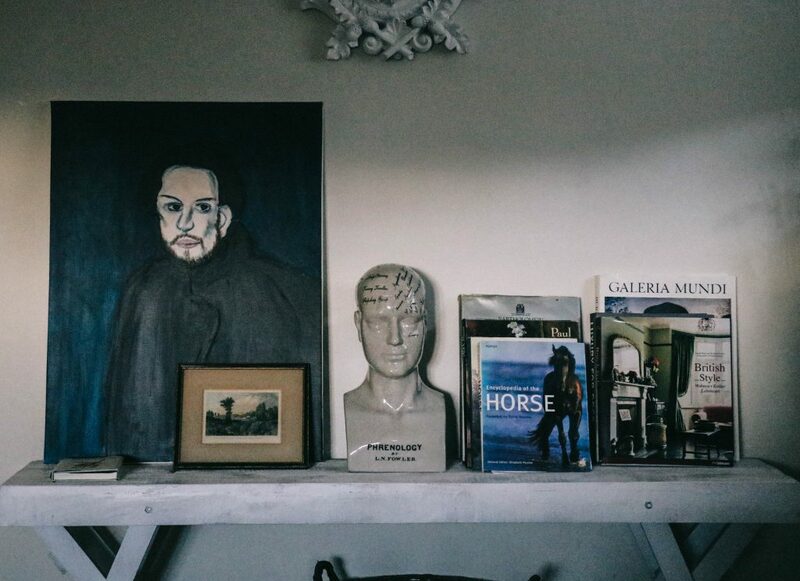 This beautiful house is Dartmoor’s poster boy – a cottage envied for its aesthetics. 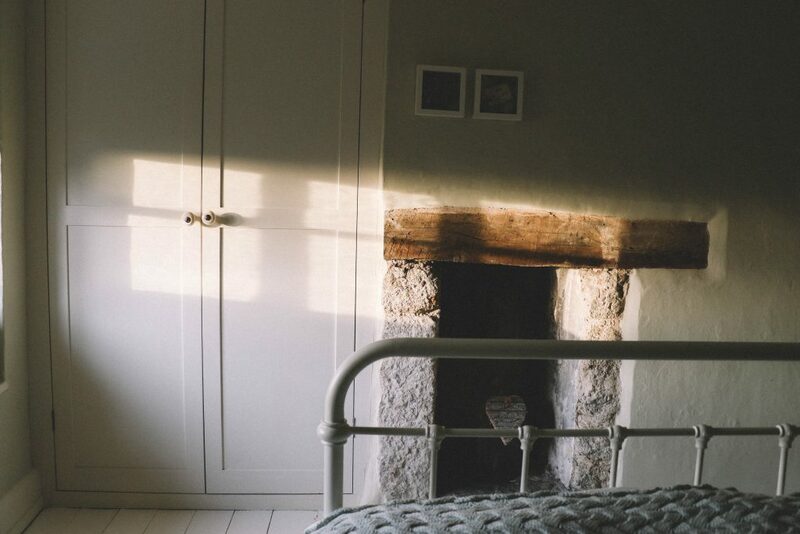 As a self-proclaimed Unique Home Stays devotee, I’ve been lucky enough to stay in their properties on the Isle of Skye, Somerset, Devon and now, Dartmoor. 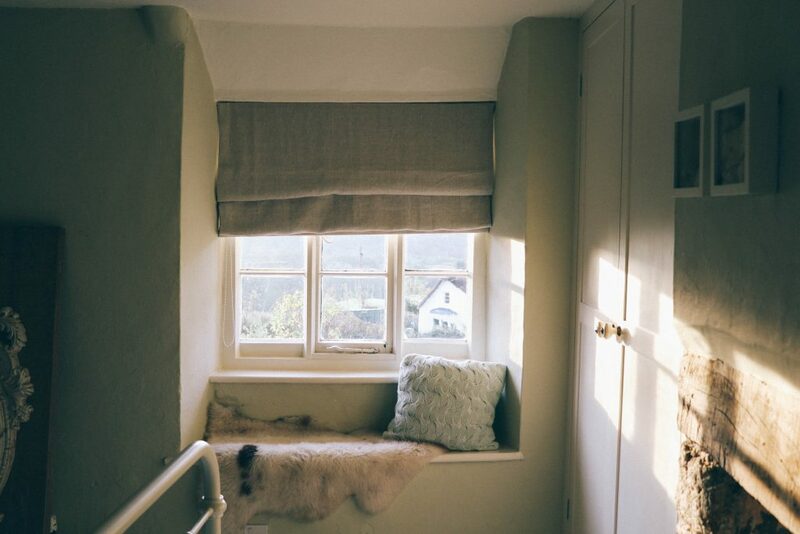 ‘Escape specialists’, their properties are true boltholes – an escapist’s heaven filled with smatterings of personal touches: personal artwork here, locally sourced woollen blankets there. 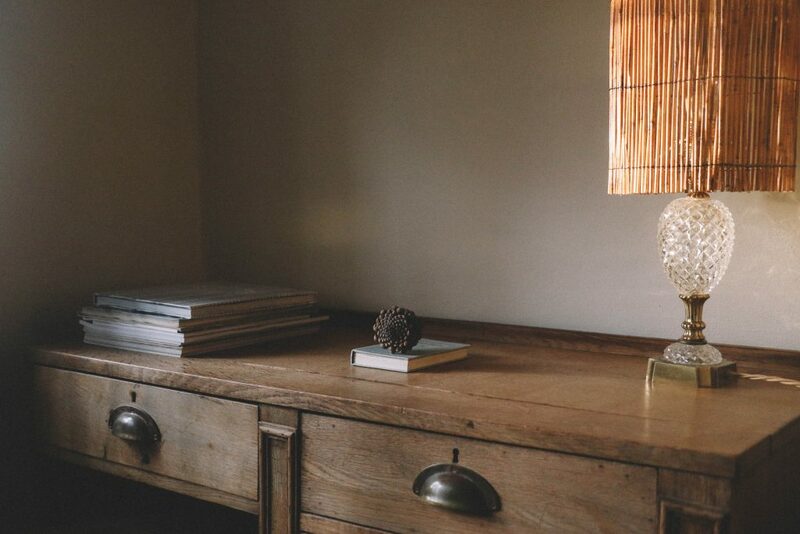 Each home has its own discrete personality, yet all share a few important traits: they are always unbelievably cosy, impeccably presented and filled with little luxuries. Inevitably, each time I visit a Unique Home Stays’ property, I like to pretend it is my own home. Opening the door to The Riddle and a rush of warm air flooded out: the heat from the cottage’s ruby-red AGA escaping into the cold evening air. A hamper of locally sourced food (including a jar of honey made by one of our new neighbours) waited for us, and a jug of pastel coloured flowers perched on the kitchen table. We were home. 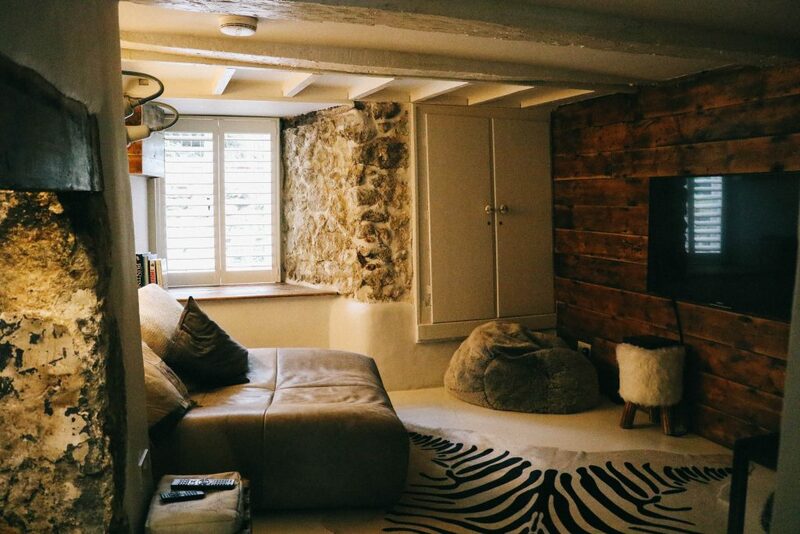 Walking through a small arch, I re-appeared in the cottage’s snug: a ‘love seat’ covered in sheepskin throws and smart TV filling the room. As the evening unfolded, we’d find ourselves hidden away in this little den; piles of blankets covering us as black and white horror films flickered on the TV. Outside the snug, the kitchen wrapped itself around much of the lower floor – the room crowned by its pièce de résistance, its glowing AGA. The warmth it gave off was incredible. Filling the stove kettle, we placed it excitedly on the hotplate and waited for its piercing whistle; the sound silencing the Dartmoor winds for just a moment. Whilst we waited, I stepped down into the cottage’s living room, where – true to form – a wood burning stove waited. Stacking together some kindling, I lit the fire before browsing the many books that were piled throughout the room. The little fire crackled into life. 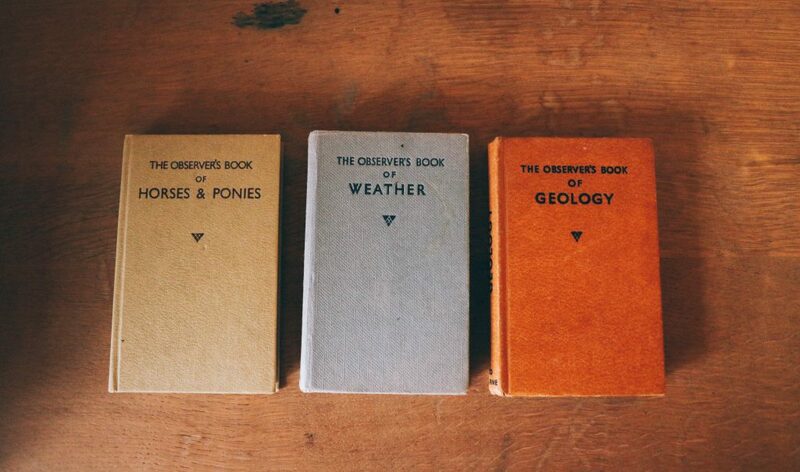 I realised that each book had a tie to Dartmoor, whether it be the small ‘Observer’s Book of Horses and Ponies’ or the glossy guides to country home interiors. I carefully put the books back and loaded another log onto the fire. 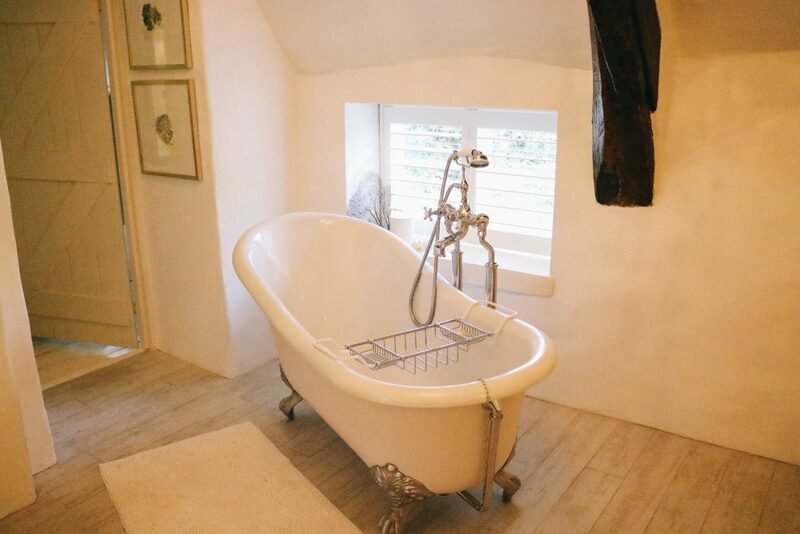 Up the creaking wooden staircase – the walls decorated with photographs of The Riddle throughout the ages – and our choice of three rooms awaited. Each were decorated a soft cream colour; thick linen blinds hanging from the lop-sided windows. 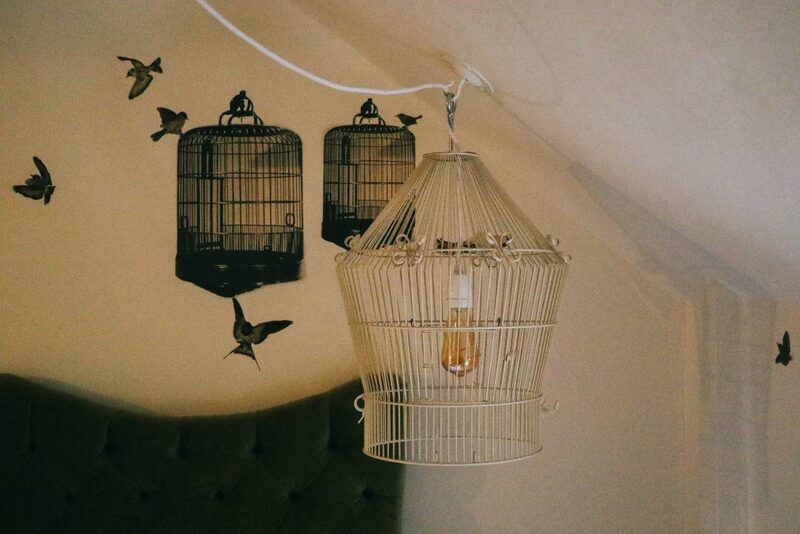 One room, the birdcage, was filled with tiny murals of birds, each perched delicately above the door frames. 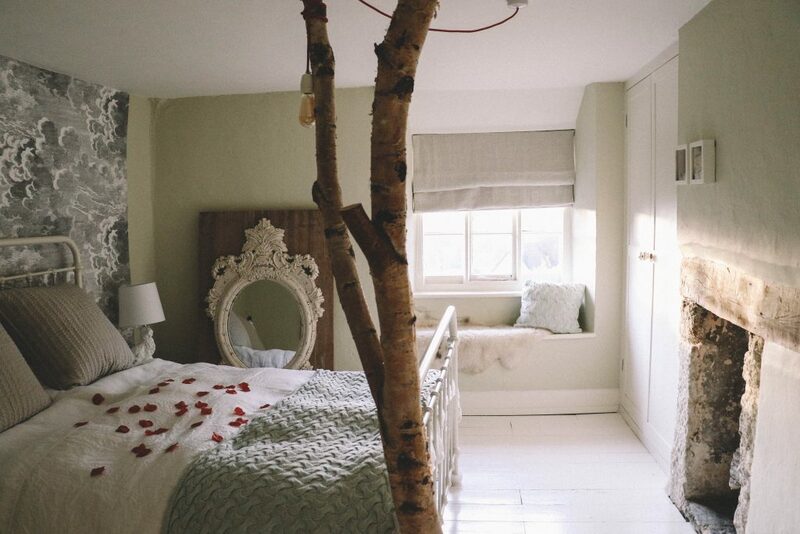 Rose petals were scattered across the bed and a delicate birdcage hung from the ceiling. I compulsively touched the brushed cotton bed linen and rearranged the little books that were stacked next to the bed. The game I like to call ‘this is my house’ was in full swing. 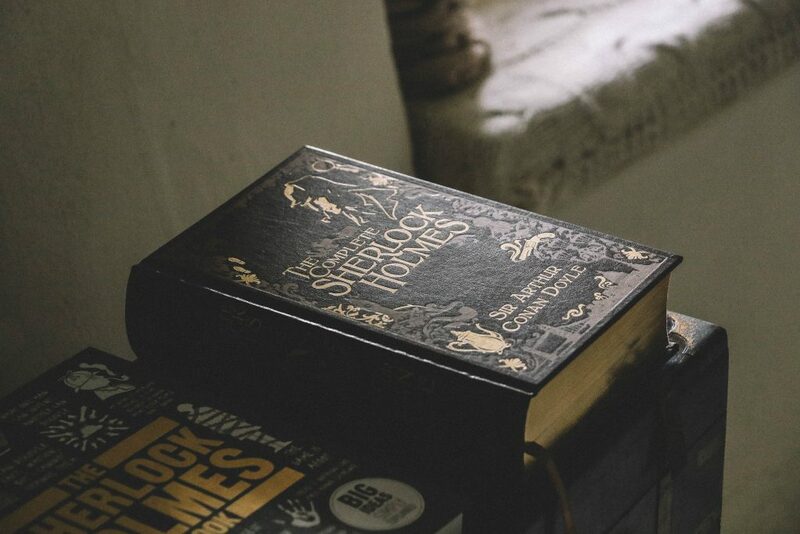 Eventually, we decided to stay in the cottage’s very own suite – the aptly named ‘Sherlock Suite’. With the location of the Hound of the Baskerville’s – Hound Tor – in the next village, the cottage’s enigmatic name suddenly made sense. This was a cottage for sleuthers, for code-breakers and riddle aficionados. Naturally, the little house therefore had its very own riddle: a safe and key waiting inside the suite for any successful code breakers. Reading the clues for the riddle, I realised I’d need to wait until morning to begin my sleuthing; hints hidden throughout the neighbouring Dartmoor towns and villages. Spotting the Sherlock-inspired coat hanging in the corner, I imagined myself taking off at dawn: a pipe in my mouth and a monocle gripped firmly in my eye. I was to be Milton Keynes’ version of Benedict Cumberbatch. As it was, I slept through until 10am the next morning: the sound of church bells waking me. We’d gone to bed as Halloween night had settled over the house: the cottage’s ancient timbers creaking and moaning in the wind. Downstairs, the loyal AGA continued burning, the house toasty warm all night. After a soak in the cottage’s enormous roll-top bath, we mapped out our next few days. 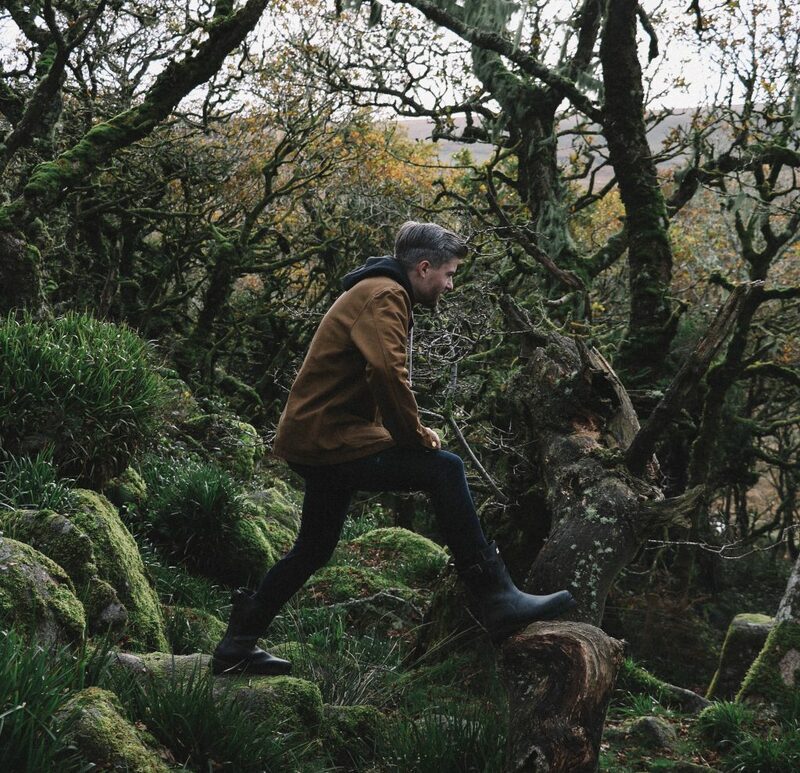 North Bovey is nestled firmly inside Dartmoor National Park, and therefore surrounded by villages, towns, stately homes, castles and beautiful hikes in every each direction. We found deciding what to do so overwhelming that in the end, we pulled suggestions out from a hat. 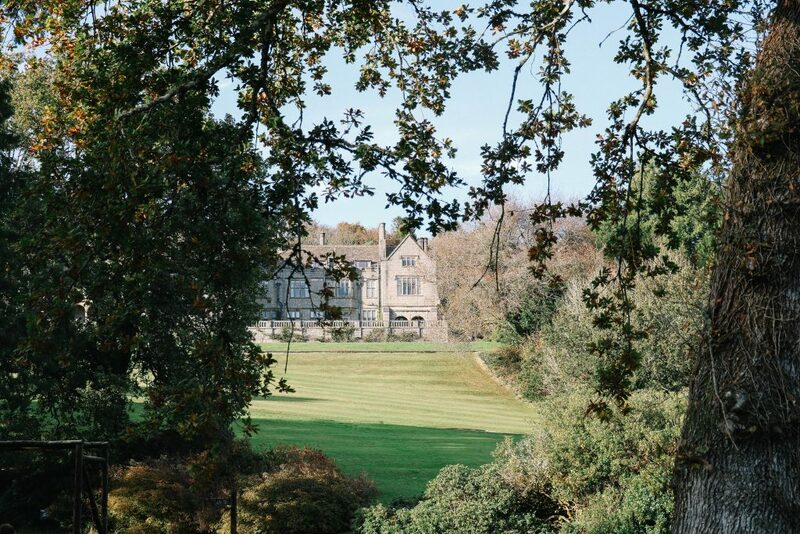 Stepping out the cottage and walking through the neighbouring graveyard, we followed the river up to the stately Bovey Castle: home to a rolling golf course, beautiful grounds and an award-winning restaurant. Walking passed the ornamental ponds, we felt a little disheveled in our wellies. However, we were soon welcomed into the Great Western restaurant for afternoon tea – wellies and all. Claiming to serve the finest afternoon tea in Devon (quite a claim, given the sheer amount of clotted cream in this area), we ate our way through piles of scones while watching the late afternoon sun dip over one of Dartmoor’s forests. It is a lovely spot to enjoy an expertly made cup of tea and to take in the stunning views. Another nearby sight is the enigmatic Hound Tor, home not only to the enquiries of Sherlock Holmes, but to a mysterious rock outcrop – one of which stands at 414m high. Close to this mysterious formation lies the remains of a deserted medieval village, dating back to the 13th century. Dartmoor can’t seem to escape its ghost stories, and Hound Tor offers no respite. Locals claim that if you visit here on a bleak afternoon, you might just come across the ghosts of Druids, cavaliers and roaming workmen. One story suggests that the Tor is in fact a hound, turned to granite by a resident coven of witches. On particularly dark and windy nights, it’s said that the hound’s ghost still stalks these moors. Conversely, Hound Tor is also where everyone’s favourite Eastender’ – Ian Beale and his then girlfriend, Melanie – came to see the 1999 solar eclipse. Ian seemed nonplussed by the prospect of stumbling across a ghostly hound, instead fixating on his plans for his Fish and Chip shop enterprise. After visiting Hound Tor, we made our way across the moorland, the scenery like an abstract painting: brown splurges of colour here, deep orange streaks there. Eventually, we reached our destination: a sight that may not regularly make Dartmoor’s visitor attractions list – the Dartmoor Prison Museum. Found in Princetown, home to the working prison, this small museum is home to original artefacts from the prison and tells the tales of its most notorious inmates. Indeed, one cabinet holds hundreds of makeshift shanks alone. Walking in, a gentleman on reception greeted us. Next to him a collection of HMP Dartmoor branded mugs sat for sale. “Welcome” he said, “there’s around 85,000 of them at the minute”. He nodded ominously towards a sign that listed the latest number of inmates inside the prison walls. “I update it every four hours” he explained, waving his pen. “It doesn’t decrease by much, unless of course there’s a riot and they escape”. I laughed appreciatively. His face remained poker straight. Walk into the museum – a room overflowing with cabinets and text – and it’s clear just how much history there is behind one of the country’s most notorious prisons. Established in 1809 to accommodate the many prisoners taken during the Napoleonic War, Dartmoor quickly filled with American and French prisoners of war. With tales of mutinies, violence and outbreaks of smallpox and typhoid, Dartmoor quickly gained a damning reputation. It was a place where criminals were sent to quarry, and to dig out bleak moorland in the freezing fog. I spotted a large sign at the back of the museum: ‘This is where the Acid Bath Murderer was condemned’, it read. Confusingly, it was written in every kid’s favourite font – Comic Sans. On the way home, dusk now settling, we stopped to eat at the highly recommended Warren House Inn, Yelverton. 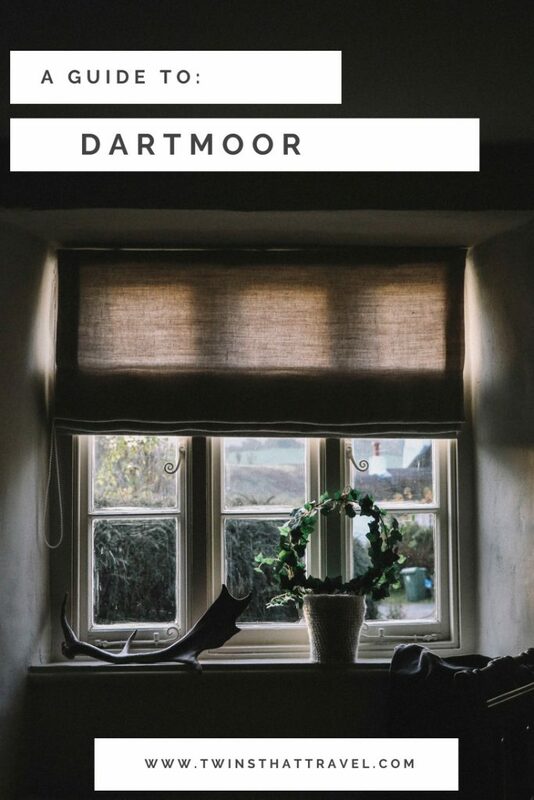 Whilst Dartmoor may be an easy target for ghost stories and tales of the supernatural, it is equally famed for its spectacular views, roaring fires and friendly hosts. The Inn encapsulates all this perfectly. Nestled deep within the National Park, with views of the expansive moorland, the Inn offers its visitors an open fire, a selection of local ales and the best beef and ale pies in town. Sitting at 434 metres above sea level, it is said to be the highest Inn in South England, and – a little sadly – the loneliest. Walking in and the place seemed, thankfully, far from lonely. 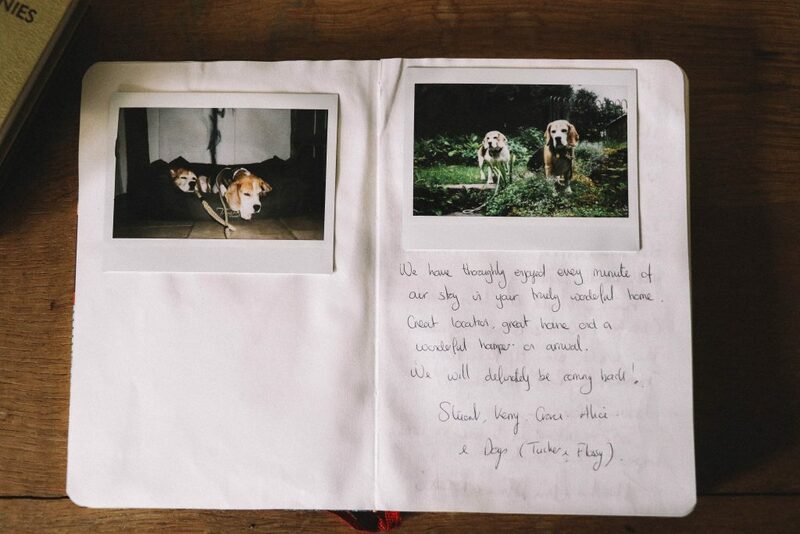 Filled with locals, dogs and families, the pub was the perfect antidote to the cold tales from the Museum. Grabbing a seat by the fire, our hosts told us that it is said the fire in the Inn has been burning continuously since 1845, when the first owner transferred smoldering peat from the original building. The Inn, they explained, was particularly vulnerable to long periods of isolation. In 1963, Warren House was cut off by snowdrifts for 12 weeks and supplies had to be bought in by helicopter. Looking around, the fire crackling, I imagined that if I were to be stuck anywhere for 12 weeks, I’d like it to be here. Having sought out tales of notorious prisoners and mythical rock formations, our final day led us a little further away from North Bovey, as we headed to Dartmouth and Salcombe. Our first sight of Dartmouth was a cluster of pastel houses, scattered up the hill that led away from the port. The sun shining brightly, the sea sparkled and shone; blue skies framing this picturesque town and its bobbing sailboats. 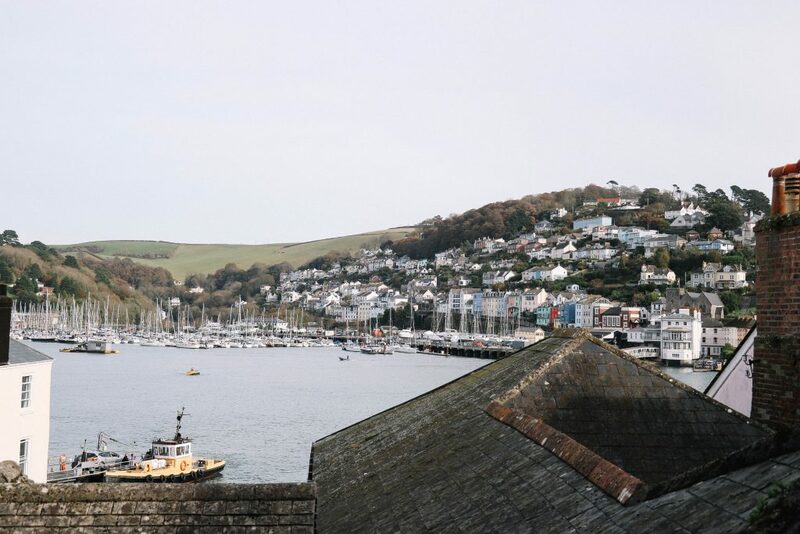 One of England’s oldest and prettiest seaside towns, Dartmouth was thankfully without its summer crowds, leaving us to wander its steeply climbing streets, alone. 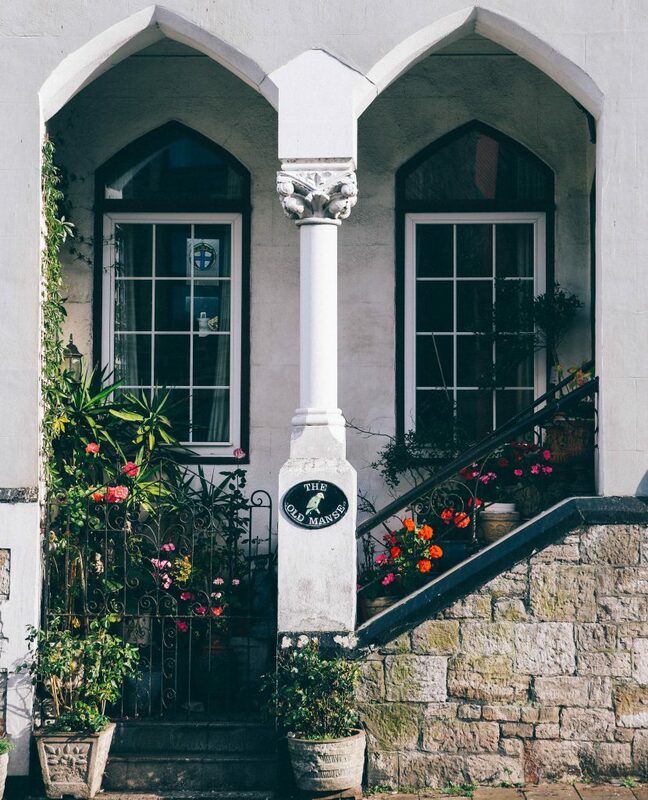 The town is filled with cobbled alleys lined with antique stores, galleries and little gift shops. However, our highlight was lunch at the Rockfish Seafood Restaurant: a small queue forming outside it as we arrived. 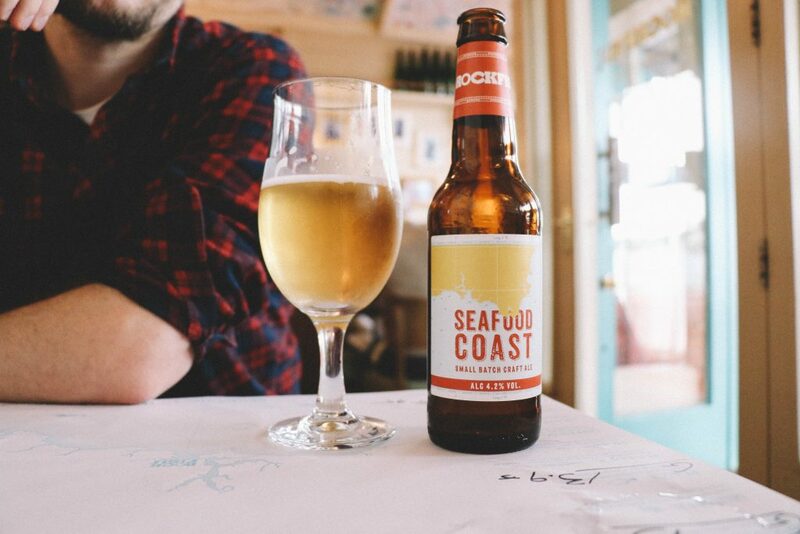 ‘British fish and chips with twist’, Rockfish is a small chain of award winning restaurants that believe in sustainable, local fishing. 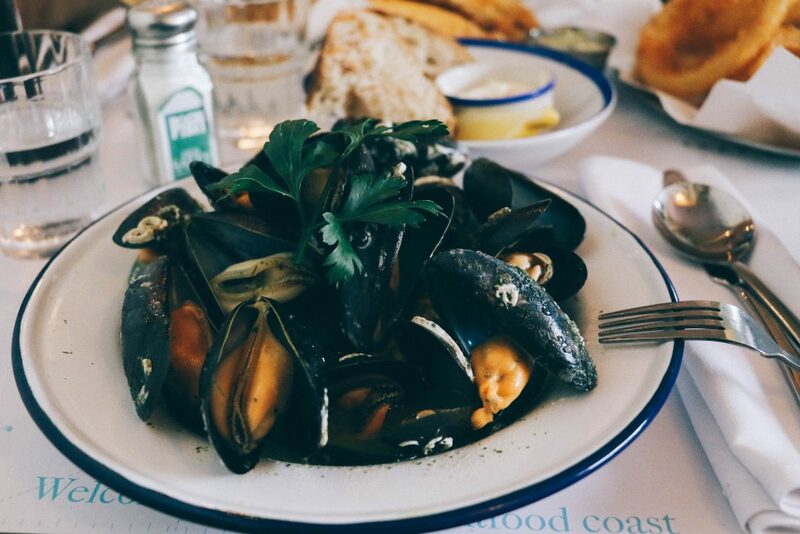 As a result, the menu changes daily, offering freshly caught mussels, Jersey Rock oysters, monkfish ‘scampi’, crab rolls and fish tacos – all served alongside bottomless portions of chips and locally brewed beer. I’ve eaten a lot of fish and chips in my time, but can promise that this was by far the best. A short drive south from Dartmouth and we dived downwards towards Salcombe: a small coastal town at the bottom of a steep valley. 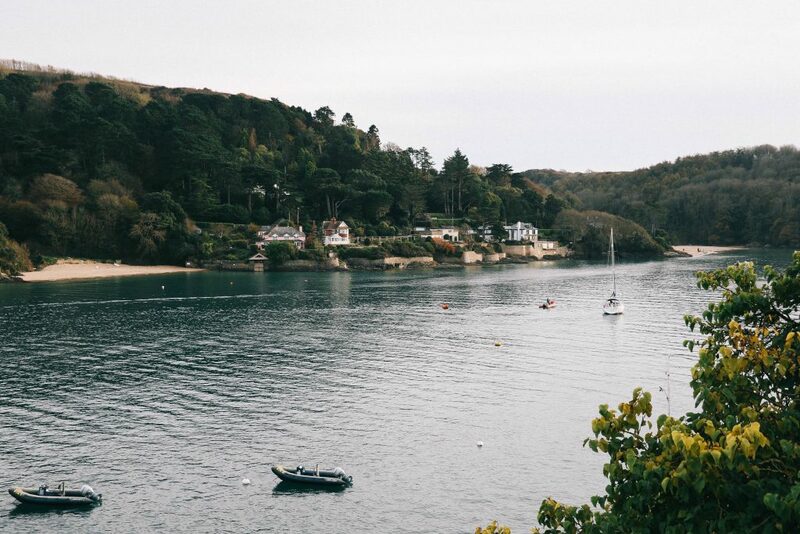 Surrounded by small coves and an almost turquoise sea, Salcombe is unbelievably picturesque. Driving through its narrow streets, we eventually parked: views over the bay and the dusky pink skies in front of us. The town, now quiet as the day drew to a close, was filled only with the sound of bells and hungry gulls. Passing down the main street, we eventually found ourselves around the back of the bay: a line of small warehouses facing the water. Walking past, I noticed a group of men hauling a small fishing boat into a warehouse. They were talking about the weather for the next day. “Tune into this channel” one told the other, “and you’ll get the right weather report”. Suddenly, I was reminded of one of the clues that made up our riddle – a clue asking how to hear the local news in North Bovey. It was a moment of divine intervention – I finally knew the winning combination. I could crack the code. After a frantic drive home – my brain sleuthing as it had never sleuthed before – we finally reached the warmth of The Riddle: our beautiful home and resident quiz host. Running upstairs without stopping to take our coats off, we put the final code into the lock and held our breath. I may have just figured out the Enigma Code, I was that triumphant. After grabbing our winnings from inside the safe (I’ll keep that bit a secret), we spent our final night in front of the wood burning stove, reliving the moment the lock had popped open. It was the perfect end to the loveliest of stays at The Riddle, and a trip to an area of England brimming with sights, sounds and adventures (ghosts and absconded prisoners optional). 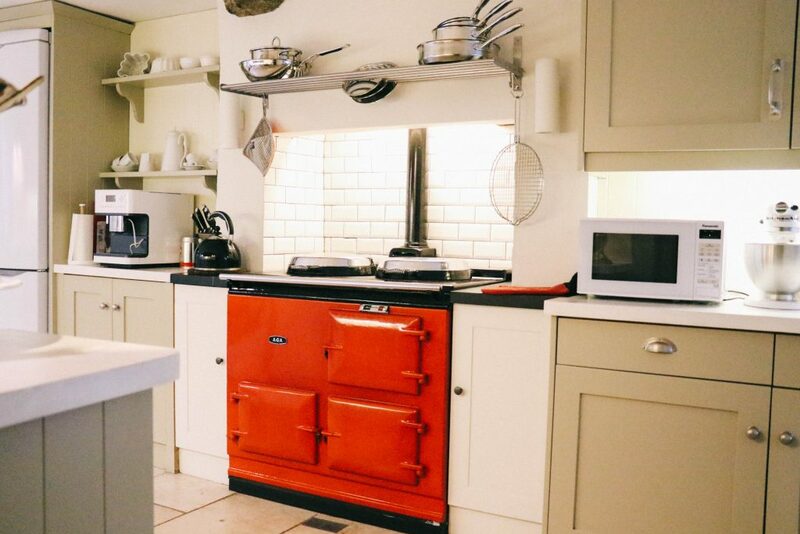 I’ll most certainly be back, if only just to use that lovely red AGA one last time. 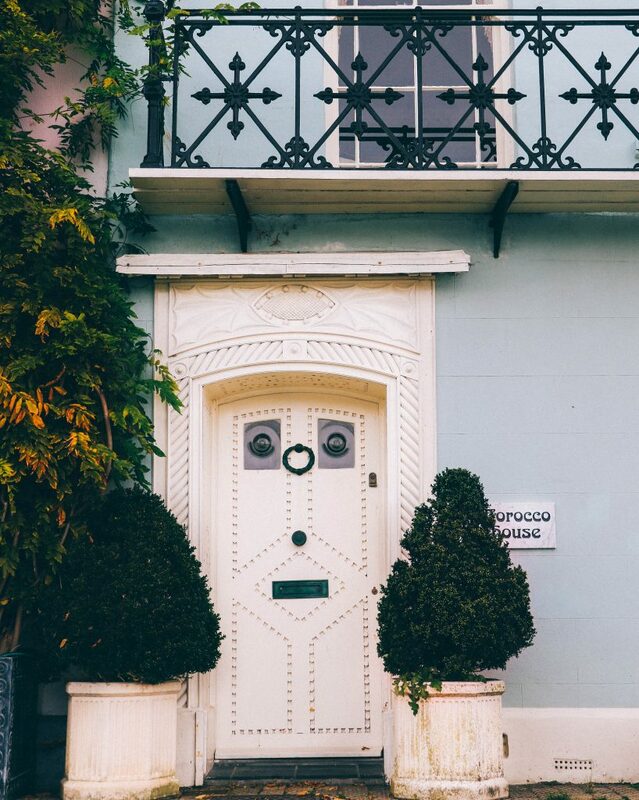 Thank you for having us, Unique Home Stays – until next time! Unique Home Stays kindly hosted us for four nights, however – and as with all their properties – I genuinely had a lovely stay. "Podcast Six: A Guide to Anna Maria Island"
Oh I do like a bit of Kate Bush! 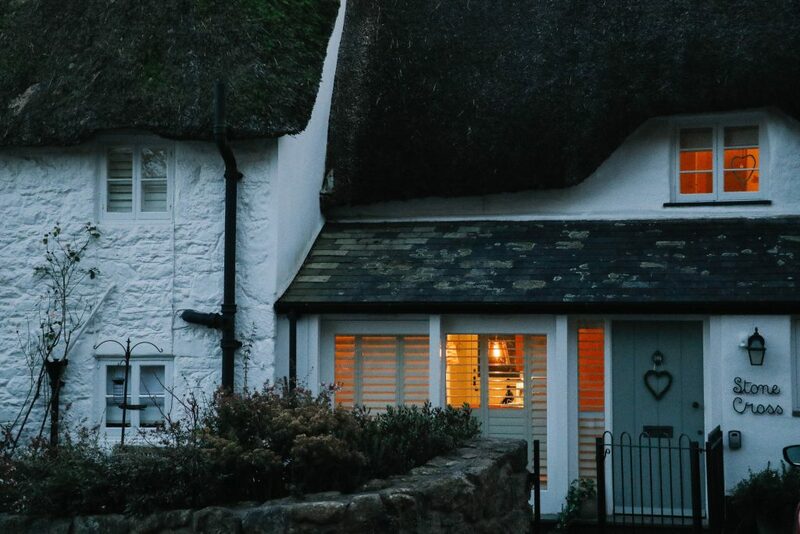 The cottage looks lovely and I love the idea of unique home stays.